The New York Jets (2-2) are in a tight spot in the league behind New England (4-0) and Miami (3-1) after an embarrassing 38-13 loss to the Tennessee Titans (3-1). The first three weeks were less demoralizing, though, as the Jets beat the Buffalo Bills (2-2) and Tampa Bay Buccaneers (0-4) in a squeaker at home. The New England Patriots, struggling to complete passes, almost gave the Jets another win, too, in their Foxborough meeting. However, expectations have sunk deep down – and in dramatic fashion – thanks to last Sunday’s blowout game in Nashville. First of all, from this point onward, wins are going to come hard. For the first time in three seasons, New York has almost zero chance of making the postseason. The Jets started out relatively strong, at 2-2, but it’s too soon to be celebrating. The schedule of the team over the coming two months is crucial… and terrifying. NY will visit Baltimore, Atlanta and Cincinnati, and play home games against the New Orleans Saints, Patriots and Miami Dolphins. All of this happens before Week 14! Combining all records of NY’s upcoming opponents, we get 25-22. If we take away the next two matches against the Falcons (1-3) and the Pittsburgh Steelers (no wins yet), the remaining record of NY’s opponents is a staggering 24-15. Hopefully, good defense will help the New York Jets to compete against the toughest teams, although it’s a bit of a stretch to see them win more than seven games. 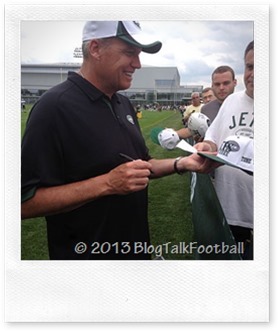 The 2013 Jets might be better on paper, but we won’t know until the games are played. The Jets could easily have been 4-0 if turnovers hadn’t beaten them. The Jets contributed at least a pair of turnovers in each game, and Jets rookie Geno Smith has given the ball away 11 times in his first four games of the season. If he continues to perform at this rate, he’ll have a record-breaking 44 turnovers over 16 games (unless Rex Ryan does something drastic). Smith makes poor decisions, which might be an understatement, since he underthrows receivers in many cases. Rookie or not, Smith has to take care of the ball if he wants to keep his starting job for the rest of the season. Also, while the Jets’ defense might be solid, it still fails to pose a turnover threat against opponents. Over the first four games, the Jets came away with only two takeaways. All in all, this turnover differential of –9 ranks merely a point ahead of the Steelers (ranking last in the league). It wouldn’t be much of a surprise if they took away Pittsburgh’s bottom spot before the end of the year.